Slide cherry tomato, piece of mozzarella onto the toothpick, followed by folded basil, more mozzarella, and lastly a tomato cut side down. 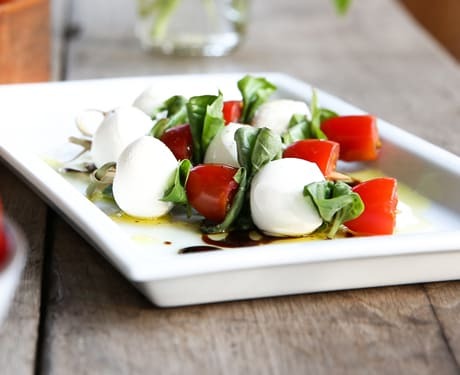 Drizzle your platter lightly with balsamic vinegar and extra virgin olive oil and arrange your mini Caprese bites on top. Sprinkle with coarse salt and cracked black pepper. In a food processor, pulse tomatoes, garlic, almonds, chili flakes, 1/2 tsp salt. Scrape bowl as needed. Add cheese. With machine still running, pour in the olive oil in a steady stream, emulsifying the puree. Add basil and pulse several times to incorporate, while keeping the bright yellow color with green flecks. Season with salt if needed. 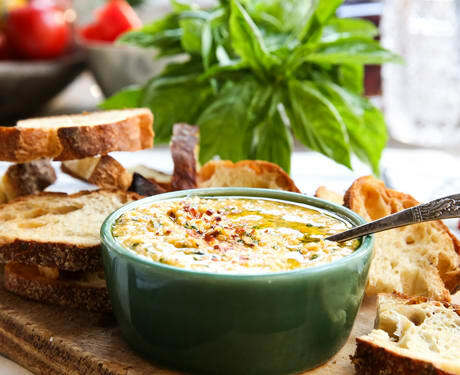 Serve with fresh rustic bread. Place 1/2 tsp sugar on small plate, wet rim of cocktail glass with lemon wedge, lightly press glass into sugar. 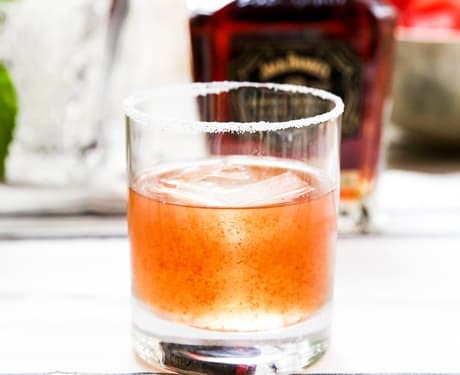 Combine watermelon, whiskey, lemon juice, adobo sauce and remaining sugar in a cocktail shaker filled with ice. Shake until well chilled. Strain into the rimmed cocktail glass filled with ice.